Nick Schultz | The Phoenix Junior guard Tiara Wallace led Loyola with 14 points in a 61-56 win over Evansville Jan. 18. 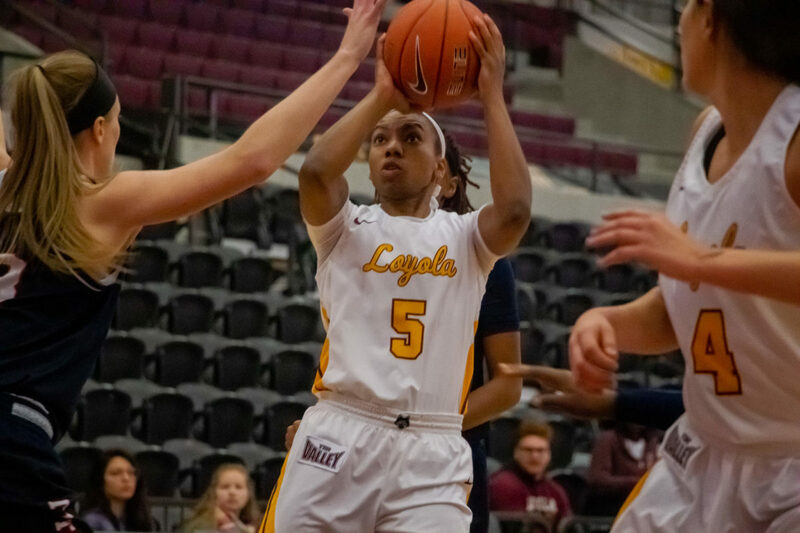 The Loyola women’s basketball team (6-2) defeated Southern Illinois University Edwardsville (SIUE) 56-43 at Gentile Arena Thursday night. The Ramblers have now won four straight games and are off to their best start since 2001-02. Loyola junior guard Tiara Wallace scored 13 points and grabbed 10 rebounds for her second double-double of the season. Sophomore guard Abby O’Connor dropped a team-high 14 points and first-year guard Janae Gonzales added 10. Both teams struggled to find a rhythm on the offensive end throughout the game. Loyola shot 17-for-51 — a 33.3 percent clip — from the field, including just 2-for-14 from beyond the three-point line. SIUE, which was picked to finish sixth in the Ohio Valley Conference and received a first-place vote in the preseason poll, shot 18-for-26 for a 32.1 percent clip. The Cougars came in averaging 33.2 percent shooting. The difference in the game came via free throws, as the Ramblers hit 20 of their 25 shots from the stripe. The Ramblers started off trailing to the Cougars 6-2 in the first quarter, but were able to come back to take a 10-8 lead after two three-pointers from Gonzales. The second quarter saw Gonzales bring her point total up to nine, and Loyola took a 25-23 lead into halftime. The third quarter was neck-and-neck, but free throws from senior guard Citiana Negatu and O’Connor kept the Ramblers in the game. Loyola went into the fourth quarter up 39-35 and outscored the Cougars 17-8 in the last 10 minutes to seal the victory. “We just attacked the basket and we got better shots,” Wallace said. Loyola is scheduled to take on Purdue University in West Lafayette, Indiana, Dec. 9. Tip-off is set for 1 p.m.